Long rumored to be a strong suitor for free agent infielder Manny Machado, the Chicago White Sox have offered the four-time All-Star an eight-year contract, according to an ESPN report Sunday. Citing league sources, the report added that one of Machado's other pursuers, the Philadelphia Phillies, would figure into the futures of Machado, as well as the other big-name free agent position player this off-season, outfielder Bryce Harper. Harper and Machado have both been connected to the Phillies. 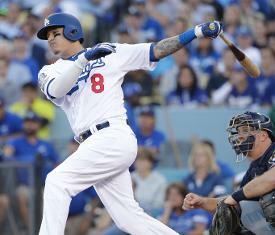 Machado, 26, who played his first six seasons with the Baltimore Orioles before a mid-July trade to the Los Angeles Dodgers, is believed to be seeking a contract in the 10-year, $300 million-plus range. Many have questioned whether Chicago would offer a 10-year deal, but the eight-year offer demonstrates the White Sox's seriousness. Machado, who has played shortstop and third base in the majors, is a career .282 hitter with 175 home runs and 513 RBIs. He has twice been in the top five in Most Valuable Player voting, and finished ninth another season. Last season, he hit .297 with a career-high-tying 37 home runs and career-high 107 RBIs combined between the Orioles and Dodgers. He also sported a .367 on-base percentage, above his .335 career average, and his .538 slugging percentage exceeded his career figure of .487.